Since July 2016, Save the Children embarked on Livelihoods and youth empowerment project in Mahama Refugee Camp, to equip refugees with necessary livelihoods skills. 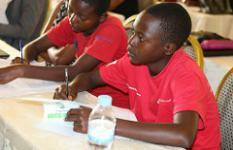 Save the Children brings Library to Burundian Refugee Camp in Rwanda. SC constructed a library in Mahama Refugee Camp to help over 38,000 school aged children and youth refugee like Jack access different books and embrace a culture of reading. Launching UNGC on public budgeting with children in an innovative way. Byiringiro helping children find protection through Child-Led Grass Root Groups. Save the Children supported Literacy Boost Project handed over to the Government for sustainability. “I am always happy to bring my child to a school with well-trained teacher, a school that also engages children in fun learning activities”, said Jeannette, a mother of Teresa, 7-year-old. Reading without limits: Investment in age appropriate Kinyarwanda Children’s storybooks to boost their reading culture.